A happy hour urban myth: Is 'breaking the seal' a real thing? It’s around the third beer when it hits you. Your bladder feels full and you gotta go -- like, now. You head to the restroom, and as you leave, your friend jokes that you're risking "breaking the seal": You urinate once while drinking and after that, you’ll have to get up every five minutes to pee. It's an urban myth that even urologists wonder about, as it turns out. “Last week we were at a dinner party and someone asked us this question. I looked it up. There is no physiological basis. There are theories as to why this happens,” explains Dr. Courtenay Moore, a urologist at the Glickman Urological and Kidney Institute at Cleveland Clinic. While "breaking the seal" remains an urban legend, alcohol does have a real impact on the bladder and the urge to urinate. Drinking alcohol—whether it's one whiskey or three PBRs—intensifies the need to go. “It can be shots, beer, volume isn’t necessary. 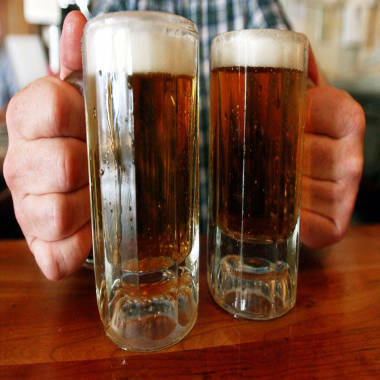 The key thing is that [alcohol] produces the increased need to urinate,” explains James Zacny, associate professor of anesthesia and critical care at University of Chicago Medicine. Alcohol consumption suppresses vasopressin, also known as anti-diuretic hormone. The pituitary gland in the brain releases ADH, which regulates water in your kidneys. “Alcohol simply blocks the normal release of vasopressin … [vasopressin] promotes re-absorption of water in the kidney to the rest of the body. If you have this blocked, the water goes into the body,” Zacny adds. Your body produces ADH when you are sleeping, for example, preventing you from waking to pee several times through the night. When you imbibe, the ADH excretion lessens, increasing your urine production. Most people’s bladder holds anywhere from 300 to 400 cubic centimeters (otherwise known as cc’s, a term ubiquitous in medical dramas). When people drink, they consume more liquids than usual; pair that with the body sending the unabsorbed water directly to the bladder, and it’s no surprise people feel more urgency. And once the drinking starts, the body goes through a vicious cycle. “[Alcohol] decreases your ADH and you are producing more fluid. So when you produce more fluid and you fill your bladder more, you suppress more ADH,” Moore says. And within 20 minutes of drinking, alcohol irritates the bladder, leading to that uncomfortable feeling of a full bladder, even if it isn’t. Moore says that she has heard all sorts of crazy theories as to why people pee more while drinking, including that you urinate more because your sphincter contracts, which is completely untrue. And while most theories about breaking the seal are false, Moore believes that some of it might be mental. “It is a level of awareness. Cognitively, you may be a little impaired,” she says, adding that you might believe that breaking the seal is the real reason you feel the urge to pee more. Want more Body Odd and other health news? Check us out!